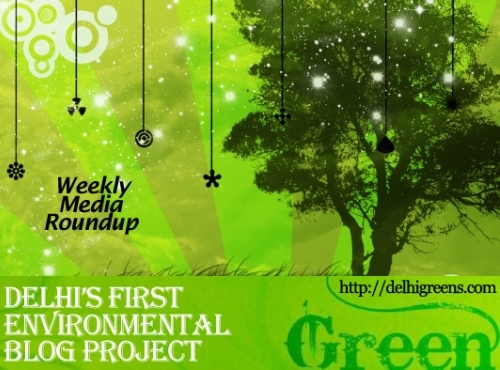 Weekly environmental news roundup from across different media networks for week 20 (between May 11 to May 17) 2015. Two projects have been sanctioned in Sonepat and Panipat towns at a cost of Rs 217.87 crore for abating pollution of river Yamuna, Rajya Sabha was informed today. Ministry of Water Resources, River Development and Ganga Rejuvenation is supplementing the efforts of the States for pollution abatement of river Yamuna, a tributary of River Ganga, by providing financial assistance to Haryana, Delhi and Uttar Pradesh in a phased manner since 1993 under the Yamuna Action Plan. Residents of Lajpat Nagar here have moved the National Green Tribunal against the operation of a parking lot by Delhi Urban Shelter Board in front of Kasturba Niketan Complex, prompting the green panel to seek the response of the city government on the matter. A Delhi resident’s plea alleging that diesel-powered inter-State taxis operating in the Capital were violating the Supreme Court directive, led the National Green Tribunal on Friday to seek the response of the government in the matter. With alarm bells ringing about Delhi’s air quality, traffic policemen in the city will soon get protective eye glasses that will shade their eyes from road dust. The National Green Tribunal has imposed hefty fines on a number of major hospitals, malls and five-star hotels in the capital that do not have rainwater harvesting systems installed within their premises. The National Green Tribunal has directed country’s anti-pollution watchdog Central Pollution Control Board and Uttar Pradesh Pollution Control Board to conduct a joint inspection of polluting industries in Greater Noida’s Chhapraula Industrial Area. A petition was filed with the National Green Tribunal seeking directions for the state government and the Union ministry of environment and forests against issuance of any licences allowing land use change in the Aravalis. The deadline for installing real-time effluent discharge meters for polluting industries located on the banks of river Ganga has been extended to June 30 this year, Rajya Sabha was informed today. The government’s efforts to clean and protect the Ganga on Wednesday got a big financial boost of Rs 20,000 crore which the Centre will spend to rejuvenate the national river in the next five years. The National Green Tribunal today sought response from the Centre and Uttar Pradesh government on a plea seeking directions to implement an emergency plan to prevent pollution and contamination of rivers in western UP. Concrete illegal structures on the Yamuna flood plains in the Agra region are in line for demolition if the stern warning and notice issued by the National Green Tribunal is an indication of the shape of things to come. The Haryana government has constituted a committee and ordered it to come up with an action plan to check the discharge of toxic waste into the Yamuna via the Badshapur drain. Kalyanji Bhai Jamuna Das Bhai Godhasara was plucking raw mangoes on his farmland in Dhava, a village in Gir Somnath district, on May 1 when a lioness attacked him. The Uttarakhand high court has disposed of a PIL opposing notification of eco-sensitive zone in Uttarkashi district of the state. 16. Link between unseasonal rains, disasters & climate change: Is India playing the ostrich? Soon after the 7.9 magnitude earthquake in Nepal in end-April , geologists based in Europe asserted that the tragedy was caused by climate change. A new study has claimed that the ‘Humpback Mahseer’, a freshwater fish found only in India’s Cauvery Basin is on the ‘brink of extinction’. It’s now time to take allergies more seriously than you ever have in your life. According to a new study, exposure to outdoor air pollution during the first year of life increases the risk of developing allergies to food, mould, pets and pests. The US space agency is set to launch a new online tool to protect endangered blue whales.